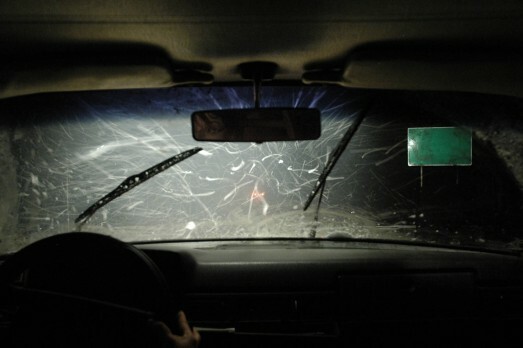 Near Miss is the second in a series of related works dealing with perception, coincidence, and memory. 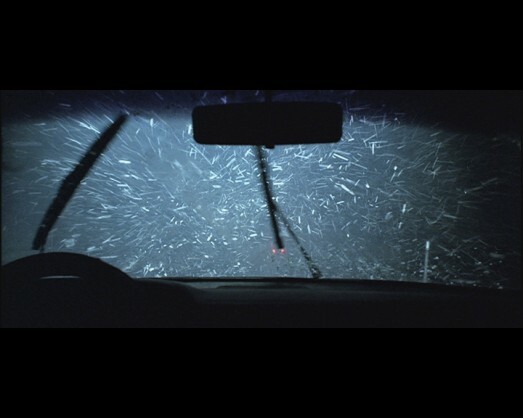 Insofar as the film is an attempt to reenact an undocumented event witnessed only by its director ten years past, the work touches on the problems associated with the objective communication of subjective memory. Near Miss consists of three nearly identical cinematic "takes." 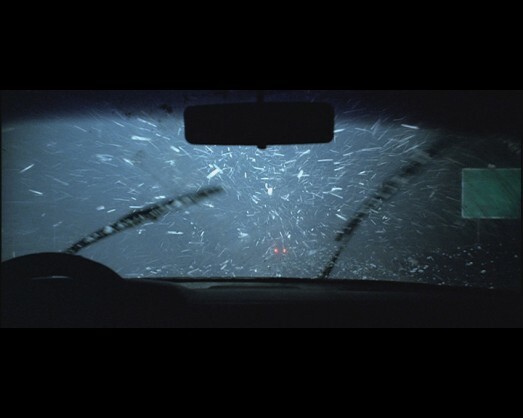 In each, the camera is positioned inside a car that appears to be driving late at night though a snowstorm. Highway markers and a road sign slip by on the right, and the red tail-lights of another car can be seen in the distance on the road ahead. 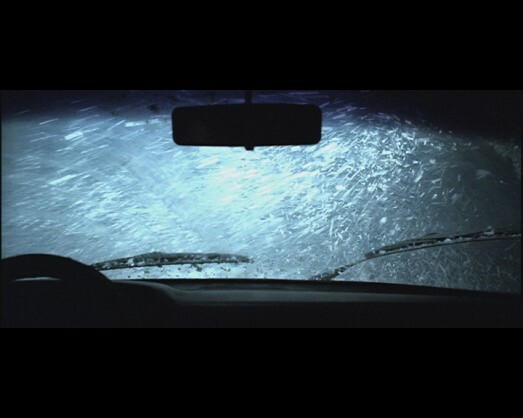 After about a minute, the car begins to lose traction, fishtails, then spins around to face the way it came, sliding backwards until it finally comes to a stop. The image cuts to black, and after several seconds, another take begins. Each take is accompanied by its own unique sound track, and each reveals subtle differences in the details of its execution. 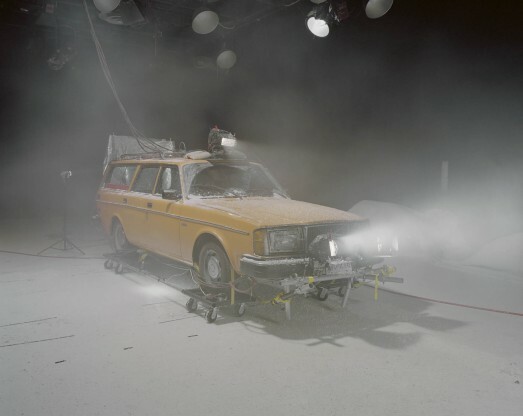 Accompanying the film, but never in the same space, is a large color photographic production still of an orange Volvo station wagon, raised up on dolly wheels and elaborately outfitted with lights and cables, inside a film studio. The room is filled with the hazy residue of fog and snow machines. In the background, artificial snow banks and a prop sign can be seen. 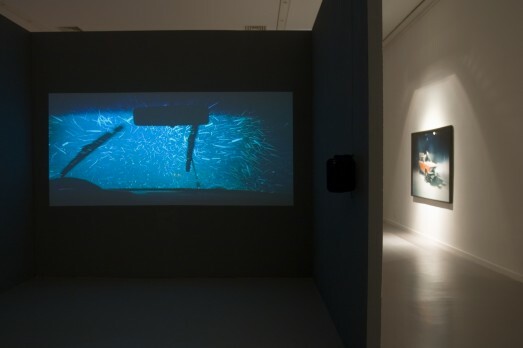 Also exhibited in conjunction with the film is one or more from a series of texts that describe the original event depicted in the film as understood by different members of the film's production team: the camera operator, special effects crew, sound designer, etc. Each text offers a different "take" on what originally transpired, none with any greater authority than the others. These may be included in the exhibition in any number of ways. 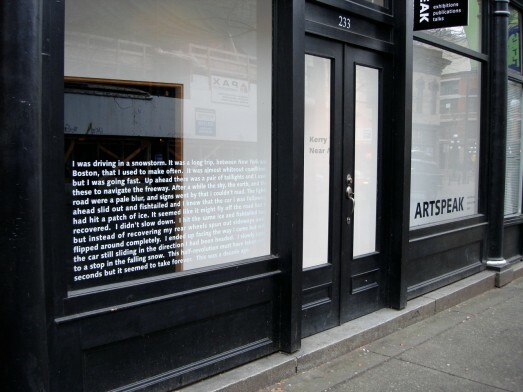 For one exhibition, a text might be sent on postcards announcing the show; for another exhibition, a text might accompany the official press release; for a third, a text might be printed on the gallery wall along with the film's production credits, or memorized and recited by the gallery staff or exhibition curator. The artist/director's version is never included among these texts: it can be understood as the cumulative effect of the collaborative effort manifested in the film itself.